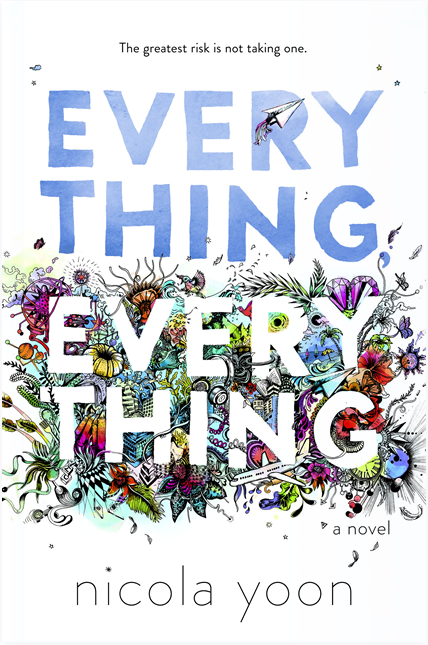 Everything, Everything was a much anticipated debut novel written in an interesting format that includes lists, illustrations (done by the author’s husband! ), IM conversations, as well as regular text. But we’ll get to that later. First, I want to talk about that gorgeous cover! I’ll admit I’m a sucker for pretty covers and I do, in fact, judge books based on them. It’s not that I won’t read a book with an ugly cover, but let’s face it – pretty ones hold more appeal and are more likely to be prominently displayed on my bookshelves. I would’ve picked up this book based on the cover alone. Now let’s get to the meat: this book is an easy read that you can devour in one sitting. Because of the writing style I mentioned above, the pages just seem to fly by. I’ll be honest, some parts of it had me saying, “Really? This would never happen.” But if you don’t take it too seriously it’s a pretty entertaining read. It tackles some tough subjects such as alcohol and physical abuse, but manages to stay fairly lighthearted and even funny. It is fairly predictable – I figured out most things before they actually happened, but it kept my interest and I finished it in just a few hours. I would recommend this book to anyone who enjoys a YA romance and isn’t too turned off by a few cliches. Right after I finished reading it I gave it 4 stars, but upon further reflection I think it deserves more of a 3.5/3.75. I will say this though: if this was Nicola Yoon’s debut then I’m definitely looking forward to anything she writes in the future! Ooooh very interesting! This is probably the lowest review of this book I’ve actually. I’ve heard a lot of really good things! P.S. love your little flames! I’ve seen such good things about this one, agree that the cover is just gorgeous!